After being in Thailand for an extended period of time, when you are in Bangkok Khaosan Road is definitely not the first area that you are eager to visit. Since it was our American holiday weekend, we figured that Khaosan Road was the best place to run into travelers, backpackers and expats and hopefully find a way to celebrate despite being away from the Land of the Free! We did some research and found a great hotel right on Khaosan, D&D Inn with a rooftop pool, swim up bar and decent rooms. After our stellar rendition of the National Anthem we left school and hopped on the bus to Bangkok. We were in our red, white, and blue suits soaking up the sunshine and jumping in the pool by 1pm. Well worth the semi embarrassment. As the day played out we began to meet new tons of new people. The pool was packed and we were surprised to meet a big crew of Americans. They understood our excitement! 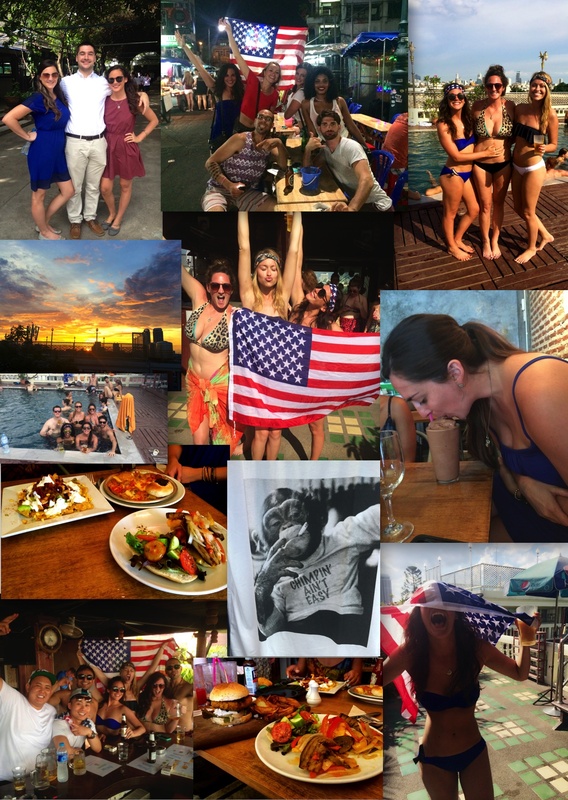 Things escalated quickly from there and despite the dirty looks we ran around that pool deck waving our American flag and made sure that every single person knew what July 4th meant to us! We even befriended a few Brits, Irishmen, and EVEN Canadians (LOL inside joke). The party continued that night on Khaosan Road, which is an experience like no other. For the rest of the weekend we continued to take over the rooftop pool, meet amazing people, shop, eat, dance, and especially laugh. We reunited with teacher friends that live in different areas and when we get together my cheeks literally start to hurt. Funny people make the world go round. On Sunday we made the best discovery of the weekend, a little brunch/dinner spot a short tuk-tuk or even walk from Khoasan called Chomp. The food, coffee, sangria, milk shakes and desserts were heavenly. Yes, we tried them all…And, yes we not only ate brunch there, but also stayed late in Bangkok just so we could go to dinner there too. Nothing and I mean nothing pleases my friends and I more than a good meal, especially a good western style meal. Don’t get me wrong I ADORE Thai food, but in my town there are absolutely no options for other styles of food and sometimes you just need to satiate your craving for Italian, Mexican, Indian, French and ESPECIALLY SUNDAY BRUNCH. A twenty something girl has GOT to have a good Sunday Brunch spot, it’s basically a part of our genetic make up. After an action pack weekend in Bangkok school on Monday was extremely difficult but luckily my students’ smiling faces always make me feel good about where I am Monday morning. I really have the best of both worlds. It was an exciting week at school but a very unusual one. We had a large group of exchange students from Tasmania, Australia visiting and staying with the families of our EP students. They were here for only two weeks so there were a lot of extracurricular activities planned for them and it switched up the regular schedule of the school week. We also had a huge event for the 10th Anniversary Celebration of the Sa-nguan Ying English Program. This was a festive event with all of the staff, teachers, parents and of course the students. 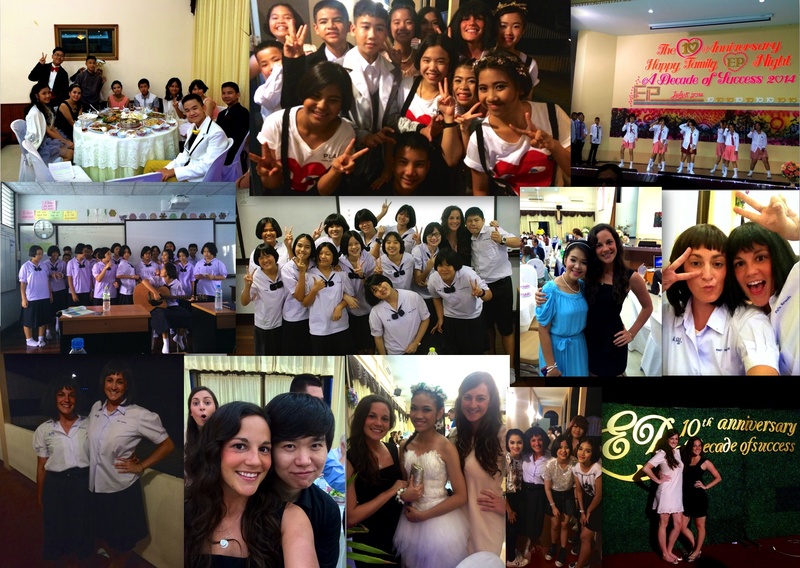 There was a Thai style feast, speeches, and dance/song performances by each grade level of students. The teachers were asked to put together a performance as well and we came up with a hilarious skit where we dressed up in the student’s uniforms and pretended to be naughty students. We ended with a kick line and belting out of the classic “We Are Family” because that is our adopted motto in the English Program. We are not just a school but we are the EP Family. It was a great night celebrating and I loved watching my students come to life when they performed. Before we knew it, it was Thursday, the week was over and we were hopping on the night bus to Chiang Mai so we could explore the northern mountain town of Pai for the long holiday weekend. 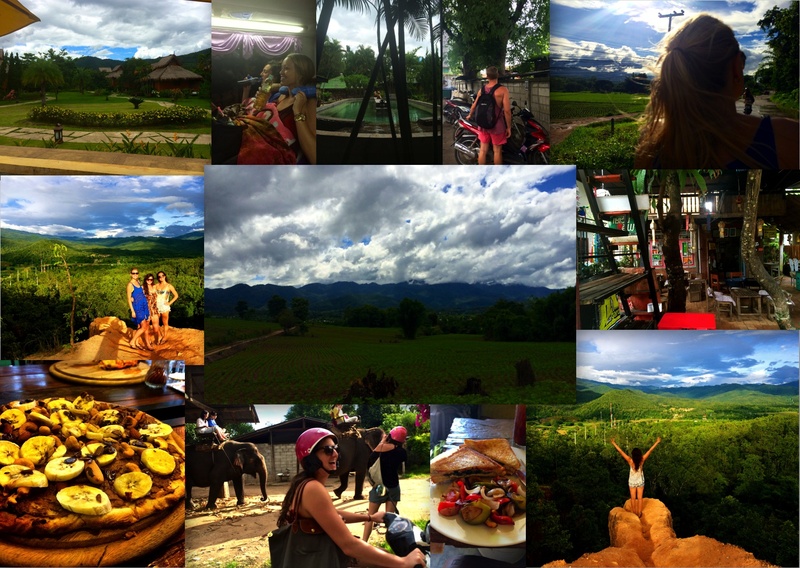 After a 10 hour bus to Chiang Mai, and a 3 hour van ride on one of the windiest roads I’ve ever experienced we arrived in Pai and I instantly knew it was well worth the trip. The views of the mountains were everywhere you looked and it reminded me of the mountains of West Virginia and Upstate, New York (my two homes). The town of Pai is very small but the vibes are powerful. There is an endless supply of quaint restaurants and cafés with AMAZING food, outdoor activity spots, and countless wide open mountain roads. Maggie and Jackie have already been to Pai so we rented two motorbikes, I hopped on the back and they showed me around town. We found an amazing pool and natural hot spring a short ride out of town and later visited Pai Canyon. At night the main walking street turns into a night food market and I can’t even begin to describe all the deliciousness we experienced. Unfortunately we forgot the very important Buddhist holiday meant that no bars could serve alcohol. We found our way around this sneakily and had a great night with the crew staying at our hostel and even our favorite Brit friends we made the previous weekend in Bangkok. We managed to locate the only bar in town that was open. We woke up and did it all again. The relaxing atmosphere, the incredible scenery and nature, the genuinely friendly and fun travelers and residents, the amazing food and the overall aura about the small quaint hidden gem in Northern Thailand definitely puts it at the TOP of my list for travel destinations in Thailand. I would have stayed forever if I could. But teeaachhha duty called and on Sunday evening we were back on the overnight bus to Suphanburi. Another amazing Zuba blog entry. It sounds like it will be a bit difficult to re-adjust to our U.S. culture when you finally come home to us. We love you. You are an amazing writer, a thoughtful philosopher and a wonderful person.